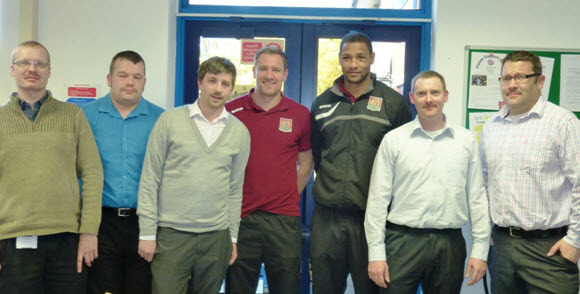 Staff at National Accident Helpline, have been taking part in Movember to raise funds and awareness for prostate cancer, in support of Northampton Town Football Club’s (NTFC) Movember campaign. NTFC visited personal injury claims company National Accident Helpline HQ in Kettering, Northamptonshire, where a number of staff have been sponsored to grow moustaches during November, and are pictured alongside Clive Platt and Kelvin Langmead showing off their facial hair. Movember is responsible for the thousands of moustaches on men’s faces in the UK and around the world throughout November, helping raise funds and awareness for men’s health, specifically prostate cancer. Women at National Accident Helpline were also doing their bit by sporting fake moustaches for a day. You can donate to Movember via the team’s fundraising page. National Accident Helpline is the biggest and most experienced personal injury claims company in the UK and has been championing consumers’ rights and providing access to justice since 1993. During November each year, Movember is responsible for the sprouting of moustaches on thousands of men’s faces in the UK and around the world. Each Mo Bro must begin the 1st of Movember with a clean shaven face. For the entire month each Mo Bro must grow and groom a moustache. There is to be no joining of the mo to the sideburns (that’s considered a beard), there’s to be no joining of the handlebars to the chin (that’s considered a goatee) and each Mo Bro must conduct himself like a true gentleman. National Accident Helpline's Mo Bros!